There is nothing like waking up to the aroma of coffee brewed from freshly ground coffee beans. That coffee will taste even more exceptional if the beans are used within a few days after roasting. 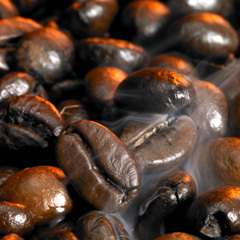 In order to produce a savory cup of coffee, the coffee beans must first be roasted. Skillful roasting is the key to great tasting coffee. Beans may be roasted by a coffee roasting company and packaged for the consumer, or the coffee aficionado may wish to roast his own beans. The most flavorful coffee is produced from freshly roasted coffee beans. As the green coffee beans roast, the sucrose in them caramelizes, and they turn darker. A chemical reaction occurs from the heat, and the coffee flavor and aroma are unlocked. During roasting, coffee beans change color from green to brown, expanding to almost double their original size. The length of roasting time determines what darkness and flavor will be produced in the final brewed coffee. 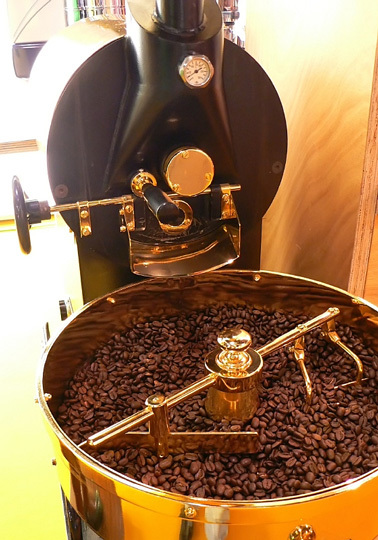 Commercial coffee roasters begin by cleaning the coffee beans, which are then moved to a roaster operating at temperatures between 370 and 540 degrees Fahrenheit. Depending on the desired roast darkness, the beans are roasted anywhere from a few minutes to a half hour. They are then cooled, screened, and stabilized. Some of the dried beans are packaged whole while others are ground before packaging. Home roasting, which was common until the commercial roasters gained popularity during the 20th century, has become popular again. A new generation of coffee connoisseurs can purchase computerized drum roasters that simplify home roasting. The traditional method is to use a frying pan, stirring the coffee beans over a heat source until the desired roast color is reached. The beans must be kept moving so they will roast evenly and not burn. Coffee beans have to be roasted hot enough and long enough to avoid a bland or baked flavor. However, they must be watched carefully after they reach "first crack," a snapping noise from expansion, which happens when they reach about 400 degrees Fahrenheit. The oil develops at this point, and the beans start to darken. When the desired darkness is reached, the beans are removed from the heat source and cooled by either cold air or cold water. Allow the beans to rest for about 24 hours after roasting, so that the coffee can reach peak aroma and flavor. The following chart shows the characteristics of the most popular coffee roasts. Roasted coffee beans are best when used within a month. Once ground, coffee is best when brewed within 24 hours. Through the art of the coffee roaster, green coffee beans have been transformed into the savory, brewed beverage we all enjoy. Features high quality coffee, Italian style espresso, pastries and other coffee-related products. One of the original coffee companies from Seattle offers retail and wholesale services. This Vermont-based coffee roaster strives to provide high quality coffee with rich aroma and flavor. Green Mountain features organic, fair trade and Signature coffee blends. Founded in Rockville, Maryland by the original founders of Starbucks Coffee, this quality coffee roaster strives to provide its customers with fresh, flavorful, roast-dated coffee. This Hawaii-based firm offers Hawaiian coffees including Kona, Peaberry, and Maui estate varieties as well as flavored coffees and blends. This gourmet coffee roaster and tea blender features an online coffee shop offering gourmet coffees and flavored coffees, as well as coffee makers and exotic teas. This Hawaiian-based company features green coffee beans, custom roasts and grinds, and coffee brewing tips. Founded in Oklahoma in 1972, this firm offers a selection of fine coffees, teas, and accessories as well as coffee roasting, grinding, and brewing information. Allegro features a unique array of organic and other coffees that span the roasting spectrum from Full City to French roast. Available at Whole Foods Market locations. Terroir works directly with coffee growers to produce high quality, single-source specialty coffees. This Illinois-based coffee company offers a selection of fine coffee varieties, roasted daily in vintage German roasters. This Minnesota-based coffee roaster features pure and blended coffee varieties, shipped quickly to their customers. Coffee tasters and reviewers conduct blind, expert cuppings of coffees and report their findings on this coffee buying guide website. This California-based coffee company provides green coffee beans and coffee roasting appliances to home coffee roasters. Browse their extensive coffee cupping reviews, featuring coffees from around the world.